Microsoft has released Windows Template Studio (WTS) v 3.0, extending support for multi-project solution and Pivot navigation pattern. Microsoft has released Windows Template Studio (WTS) version 3.0 which is its first major update since version 2.0 (April 2018). 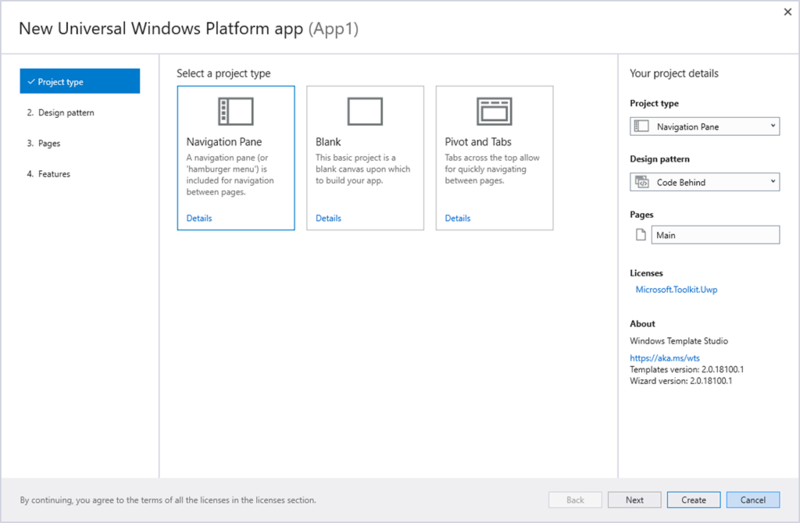 WTS is a Visual Studio 2017 Extension that quickens the development of new Universal Windows Platform (UWP) apps using a wizard-based experience. The new release brings support for multi-project solutions, Pivot navigation pattern, and some bug fixes. Code now generates as a multi-project solution. This will allow better reuse and separation of code logic, and now will output a UWP project and .NET Core project. You can read the complete changelog at WTS's Github. Visual Studio 2019 Preview support for multi-project might give NuGet reference failure for the Core project. (#2862). You can work around it currently to manually add the reference. Feedback hub has been detached until a bug gets fixed in their SDK (#2879). Microsoft also revealed what it has coming in future releases. The next version v3.1 will see a Menubar navigation pattern template, Identity Login, and Azure features. And, there will be better VS 2019 support and Unit Test projects.